DANA POINT, CALIF. (March, 21st, 2017) – GuardTop LLC today announced that it will be opening two new GuardTop Express locations in Tucson, Ariz. and Orange, Calif as it continues to build out its national network of distribution locations. The new distribution centers are slated to open on March 24. 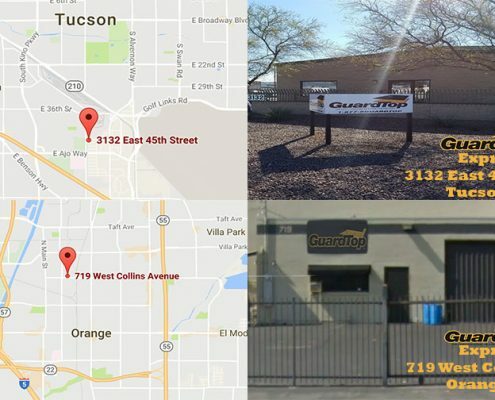 GuardTop’s launch of the Tucson distribution center will be the first GuardTop Express location in the Southwest. The company will be opening a 3,000 square-foot facility and providing its full range of sealcoat products, including its premium sealcoat as well as SS1-H. In addition, as an added service to the contractors it supplies, GuardTop Express locations will also offer a wide variety of pavement tools. The distribution center will be conveniently located off Interstate 10 in Tucson, near Davis-Monthan Air Force Base and will serve as a pick-up location for contractors in the greater Tucson metro area. GuardTop has been actively distributing product in the Orange County market for many years and will continue its ongoing relationships with its many customers in the area. The 1,500 square-foot distribution center, located at 719 W. Collins Avenue near Angel Stadium, will serve as a convenient pick-up location for Southern California contractors, in addition to the other existing California GuardTop locations. The first location in Orange County will also be growing its inventory line to include all products and services offered at the Tucson location. GuardTop LLC, a premier manufacturer and distributor of premium asphalt-based sealcoat, has operations in Southern California and Arizona, serving the Southwest US and in Georgia, serving the Southeast US. For more information on GuardTop’s expansion, distribution centers or products, please visit www.guardtop.com or call 877-GUARDTOP.